This is because graduates of technical/vocational education are capable of creating their own jobs and not depend on the government to employ them. “The Sunyani Technical University is appealing to government for financial clearance to employ additional staff to facilitate the smooth running of new 4-year Bachelor of Technology programmes and also remain competitive in the academic front." “...the Technical Universities are mandated to provide higher education in Science, Engineering, Technology and Innovation based disciplines, Technical and Vocational Education and Training (TVET), Applied arts and related disciplines." The Chairman of today’s durbar, Hon. Anthony K. K. Sam, Metropolitan Chief Executive, Sekondi-Takoradi Metropolis; Guest of Honour, Most Rev. John Bonaventure Kwofie; Members of Parliament Herein Present; Board of Governors; Nananom; The Headmaster and Staff of St Mary’s Boys Senior High School; Parent Teacher Association; St Mary’s Old Boys Association (SMOBA); Students of St Mary’s Boys Senior High School; Invited Guests; The Press; Distinguished Ladies and Gentlemen; All Protocols observed. I am extremely happy to be here today, to be part of the 70th anniversary celebration of St Mary’s Boys Senior High School, Apowa, Takoradi, my alma mater. First of all, may, I express my profound gratitude to the Board of Governors, Headmaster and Staff, the Parent Teacher Association, the Alumni Association and Students of St Mary’s Boys Senior High School for inviting me to be part of this memorable occasion. As the Guest speaker for this great event, climaxing the 70th Anniversary Celebration, I have been tasked to speak on the theme for the anniversary, which is: "70 years of Developing Quality Human Resource: a Prerequisite for National Development”"; and also to actively participate in all the activities lined-up by the Alumni Association, because I am an old boy of this great institution. Indeed, education is considered globally as a vehicle for change in human life and for national development. On the accounts of the importance of education to nation building, past and present governments of our country, over the years, have committed, and continue to commit, substantial budgetary allocations to fund education in order to build the capacity of its citizenry with the aim of ensuring availability of the needed expertise for sustainable national development. As a result, several reforms have been implemented with the aim of making education relevant to national development and accessible to every child of school going age in Ghana. For instance the implementation of the Junior and Senior High School concepts was to equip the youth with relevant skills that will help them contribute positively to nation building and to give them the opportunity to identify their talents and career paths at early stages in life. Mr Chairman, it was also to reduce the number of years spent in school at the basic and secondary levels of our educational system so that on completion of university education, government will have a pool of young and energetic graduates readily available for the development of this country. The implementation of the Free SHS Policy by the present government is to make Secondary Education accessible to every child of Ghana, regardless of the financial status of their parents, after the Junior High School Level. And this policy must be commended and supported by all for it to succeed. Mr Chairman, over the years, emphasis has been placed on grammar and Theory-based education in this country, instead of Skill-based training on the basis of Science and Mathematics, and this has not yielded much results in advancing the course of our development as a nation. Presently, the government is seeking to place more emphasis on the Technical and Vocational Education and Training (TVET) Sector, as this has the propensity of imparting practical skills and knowledge, intertwined with entrepreneurial acumen, to the teaming Youth of this country. This will make the Youth readily employable by industry and also give them the potential to create jobs for themselves and many others, to reduce the acute graduate unemployment spate in the country. In fact, TVET is seen as the best approach for Ghana’s human capital development to accelerate the country’s industrialization drive that is being pursued by the present government through its flagship programmes such as the 1D1F, Ghana beyond Aid and Planting for Food and Jobs. Mr. Chairman, as the Head of one of the fledging Technical Universities in Ghana, I have always remained passionate about issues concerning the human resource development in this country. This is because, I strongly believe that this country cannot, and will not, develop if we continue to depend heavily on the abundant natural resources that we have, for development. Development thrives on Innovation and Innovation blooms on Technology and Technology does not come but by apposite learning. God was so kind to us, as a nation, that he endowed us with several natural resources including Gold, Bauxite, Manganese, Timber, and quite recently Oil. But we need to process the cocoa we produce, the oil we drill, and the gold we have been mining over years. Not until we begin to process these primary commodities into secondary products on a large scale, we cannot see significant development, neither can we provide decent living standards to our people. And the key to this is quality and appropriate education for all for the development of the right skills and technologies we need for value addition to our natural resources. This, therefore, calls for a paradigm shift in our educational system by putting more attention on the study of Science, Technology, Engineering and Mathematics (STEM), as well as the promotion of interest in TVET Subjects at the primary and Secondary School levels, to spearhead our industrialization agenda. Mr Chairman, permit me to ask one question that poses a challenge to our Educational System. If you do one particular thing for so long and it does not yield results, do you have any excuse not to change it to another option that has been tried and tested in other countries? Countries such as Japan, China, and quite recently, the Asian Tigers, including Singapore, Hong Kong, South Korea, Malaysia and Taiwan, all have developed on the basis of aggressive pursuit of skills development, based on Science and Technology. Ghana cannot do it differently. The only way forward, therefore, is to intensify the study of Science and Mathematics at the Second Cycle level by formulating attractive policies at the governmental level to entice majority of Junior High School leavers to enter into Science and Applied Science Programmes at the various Secondary Schools and TVET Institutions across the country. This will help prepare majority of the teeming Youth in Ghana to qualify to enter into the various programmes run by the Science, Engineering, Technology and Innovation institutions of Higher Learning, particularly the Technical Universities in the country. Specific attractive packages such as extension of Free Education to TVET, Science and Technology Students up to the First Degree Level at the Technical Universities and other Science and Technology Universities in the country would help. This is one of the key strategies that can help attract the Youth to study Science, Engineering and Technology programmes, in our Universities, to enhance innovation leading to higher productivity in this country. Mr. Chairman, with the passage of the Technical Universities Act, 2016, Act 922 (as amended), the Technical Universities are mandated to provide higher education in Science, Engineering, Technology and Innovation based disciplines, Technical and Vocational Education and Training (TVET), Applied arts and related disciplines. The opportunities that exist in the Technical Universities cannot benefit the Youth in this country if majority of students continue to offer Humanities rather than Science, Mathematics and TVET programmes at the Second Cycle Level of our System of Education. This trend must change now if we really desire to see significant development, through human capital formation, in the foreseeable future. Mr. Chairman, as mentioned earlier, the implementation of the Free SHS policy is quite laudable. However, it has come with increased student enrolment at the SHS level which will pose a challenge to the existing tertiary institutions in the country. Permit me to add my voice to the call for strategic positioning of tertiary institutions in the country, especially the fledging Technical Universities, by improving and expanding the existing facilities in readiness to help absorb the large numbers of students that will be coming out of the Senior High Schools/Technical Institutes in the 2019/2020 academic year. My advice to parents is that they should take advantage of the Free SHS Policy to ensure that they enroll all children into Secondary Schools/Technical Institutes, when they are due, so that they can achieve Secondary Education. This will enable them pursue University Education later, especially, in the Technical Universities in Ghana, to acquire the requisite skills and knowledge that will help them contribute their quota to Ghana’s development. Mr. Chairman, Distinguished Ladies and Gentlemen, today marks 70 years of St. Mary’s Boys Senior High School’s contribution to human capacity development of this country, through secondary education. This institution has, for the past 70 years, contributed its quota in producing Engineers, Technologists, Teachers, Medical Doctors, Lawyers, and so on, for nation building, especially the post-independence era. Mr. Chairman, permit me, therefore, to use this occasion to pay glowing tribute to St Mary’s Boys Senior High School, Apowa, for playing a very significant role in the development of the human capital requirement for Ghana’s development. This institution has made me what I am today and I feel proud and confident to call myself an alumnus of Marisco; and to address this august gathering as a professional Civil Engineer and an accomplished educationist, in fact, a professor of Civil Engineering. That is what Marisco has done to me and I am very proud of that. I can also confidently say that there are many past students who passed through the four corners of this great institution, some of them with us here today and many others out there, who occupy higher positions of trust in this country and elsewhere, contributing immensely to the development of our motherland. Marisco, ye ma wo ayekoo, to wit; Marisco, we are grateful to you. Furthermore, on behalf of the past and present students of this great institution, let me also pay homage to the present and past teaching and non-teaching staff for their contribution in imparting knowledge and character to many of us. Mother Ghana is most grateful to you. It is my hope that you will continue to render selfless services to this institution, and Ghana at large. And now, let me advice the current crop of students who are privileged to have the opportunity to be trained in this great institution. My advice to you is that you should take your studies seriously so that the investment made in you by government and your parents will not be in vain. This is the same opportunity some of us had, years ago, and utilized positively that has now put us in higher positions of authority in this country. You now even have a better opportunity to outdo what we are doing today in future, if you take your studies seriously. St Mary’s will inculcate in you values, character and above all, knowledge. Yours is to study diligently to come out with success at every level of your educational career. Eschew all anti-social behaviors such as smoking, promiscuity, abuse of alcohol and drugs, and above all fear God. If you abstain from all negative practices you will be able to accomplish your dreams in future to contribute your quota to the development of this country for generations yet unborn to benefit. Mr. Chairman, Distinguished Ladies and Gentlemen, before I take my seat may I congratulate you and wish all of us a happy 70th anniversary celebration. “...mandate of imparting practical skills training and critical thinking to students and called on students and graduates to understand that the country is looking up to them for solutions to national problems." "...the key objectives for the establishment of Technical Universities in Ghana are to promote Engineering, Technical and Vocational Education and Training, based on skills development and Technology Transfer, for the creation of wealth and employment opportunities to contribute to the socio-economic development of the country." ...officials of the universities, was led by Kwadwo Adinkrah-Appiah, Interim Vice-Chancellor of Sunyani Technical University. “The whole idea is that we want to help institutions ... to develop and also make sure that when the students are coming out, their talents would not be wasted,” Mr. Cyril Opon said. "... Africans could come out with innovative ways of solving their own challenges; and called for governmental and institutional support toward technological advancement." Addressing a Staff Durbar organized at the university, Prof. Ing. Adinkrah-Appiah, expressed the hope that the re-tooling of some of the university’s workshops would go a long way to enhance teaching and learning, and also boost enrolment. “Sonodwae” is an annual event designed to showcase the creative works of the final year students of the Visual and Industrial Art Department of the university through exhibition and fashion show. Dr. J. S. Korantwi-Barimah, Pro Vice-Chancellor of Sunyani Technical University performing the opening ceremony of the 2nd annual Exhibition and Fashion Show dubbed “Sonodwae 2018” of the Department of Visual and Industrial Art. STU put up a sterling performance to emerge winners of the fifth edition of the Universities, Polytechnics and Colleges (UPAC) Basketball Championship – Zone Four. An Audit Committee is a high-level corporate governance committee with the majority of members appointed as external members from among persons who do not work in the covered entity to which the committee relates. The Technical Universities require modern practical training centres and facilities in support of their mission. Ing. Dr. Agyemang Boakye entreated all staff of the university to make conscious efforts to study the Technical Universities Act and be familiar with the various aspects of it. Government would construct 20 modern TVET institutions and upgrade 35 National Vocational/Technical Training Institutes (NVTIs), among other interventions. HCIM block, which was funded by the GETFund, the Vice-Chancellor explained that the project was very dear to the heart of the institution since it was needed to qualify for the conversion criteria from Polytechnic to Technical University status. Training in practical and modern furniture design and production, Staff training in practical and modern furniture design and production as well as Research collaboration. The Vice-Chancellor underscored the urgent need for all public officials whose work involve procurement of goods and services to keep themselves abreast of the various laws and ACTS of Parliament on Procurement. "As much as possible, one needs to eliminate risks in the award of contract and also ensure that the award solicitation is done in accordance with the award clause in the contract." The Vice-Chancellor of the Sunyani Technical University (STU), Prof. Ing Kwadwo Adinkrah-Appiah says the future of the university is bright and that management will continue to collaborate with alumni to put the institution on a higher pedestal. “The future of this university is bright and my management is ready to work hand -in-hand with the Alumni Association. A strong Alumni implies a strong university”, Ing. Adinkrah-Appiah was speaking at the maiden Home-coming summit of the STU Alumni Association held in Sunyani. The Vice-Chancellor proposed that the Home-coming summit should be an annual affair to, among others, fashion out strategies aimed at advancing the course of the university. For instance, the Vice-Chancellor implored the Alumni Association to help provide internship opportunities for students, link the university with industry, provide avenues for career guidance for students and facilitate linkages that could rake in financial assistance to the institution. He further called for the completion the crèche, which is being built on the university’s campus by the Association. Twenty (20) new 4-Year Bachelor of Technology programmes as from the 2018/2019 academic year. Preparations are underway to begin one Masters Programme (M-Tech in Construction Management) this year. Current academic curricula being used in the country’s technical universities do not lay much emphasis on practical sessions in terms of grading system of students. 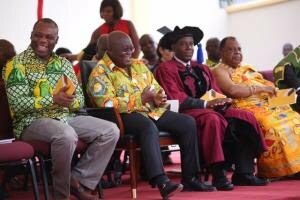 The Pro-vice chancellor of the Sunyani Technical University GA applauded the government's intention to introduce an educational reforms which will focus on Science Technology Engineering and Mathematics. As to how to attain proper implementation, Dr. Justice Solomon Korantwi-Barimah entreated government to embark on series of public interactions which will help conscientize the citizens on the need to recommend technological and technical education for their wards. "Due to the erroneous impression created about the technical and science related courses, the government has to educate the public in order to lure them to sync into its laudable idea of roping people into the STEM" Dr. Korantwi-Barima observed. He also noted that the government needs to intensify the study of the STEM IN the colleges of Education to arouse the interest of the trainee teachers to prioritize teaching and learning STEM at the basic school at well as the provision of facilities and logistics for the basic schools. The ebullient technologist noted that, it's high time technical institutions laze with industries to enquire the type of human resource to influence them (Technical Institutions) on the reciprocating courses to be taught. This he believes will eradicate the canker of technical graduate unemployment just as it happened when the technical universities were polytechnics. "We have to contact the industries for them to prescribe to the type of expertise they need so that we train our students to meet the job market. Polytechnics couldn't survive the test of time because we couldn't we were training square pegs to fit the round holes of the outside job market" he revealed. In conclusion Dr. Korantwi-Barima recounted some of the inventions from the Electrical Engineering department of the University which are basic essential artifacts which were exhibited during the maiden exhibition of the department earlier this year. "Electronic Eye, power factor Control Factor system, Wireless Power Transmission, Water Level Controller, Password Controlled System,E-voting system Stun Gun or Teaser Voltage Stabilizers, Transformers and Automatic room light controller are few of these basic essential artifacts the department has invented" he said. The President of the Republic, Nana Addo Dankwa Akufo-Addo, has indicated that, as part of the educational reforms being undertaken by his government, he has directed the Ministry of Education, and the Ministry responsible for Science and Technology to draw up programmes to strengthen and upscale the study of Science, Technology, Engineering and Mathematics (STEM) right from the basic level. Student enrolment at the Sunyani Technical University (STU) has increased in the 2017/2018 academic year, Professor Kwadwo Adinkrah-Appiah, the Vice Chancellor (VC) has said. Prof. Adinkrah-Appiah said this at a matriculation ceremony held to officially admit fresh students to pursue various programmes in the academic year. Prof. Adinkrah-Appiah said student enrolment which stood at 1,532 last year, has registered a 45 per cent increase in the current academic year and expressed the hope that the positive results would be sustained in the coming years. Prof. Adinkrah-Appiah said NAB had completed its assessment of the University’s preparedness to start the new programmes, and it is waiting for the NCTE to give clearance to enable the NAB to issue the accreditation. Prof. Adinkrah-Appiah said the University has recently signed a Memorandum of Understanding (MoU) with two universities in Germany and the United States of America which focus on academic exchange programmes between the STU and the UMES, Maryland, and Fachocschule Dortmund, Germany to exchange faculty, staff and students. Prof. Adinkrah-Appiah said summer vacation employment has been arranged for Tourism and Hospitality students of the University at Ocean City, a world class tourist centre in Maryland to help them to gain practical experience and international exposure in the hospitality and tourism industry. The Sunyani Technical University has signed an MOU with the Dortmund University of Applied Sciences and Technology to partners each other. Welcome you all to this memorable ceremony which symbolizes the inauguration of the Sunyani Technical University, launching of the new University Logo, launching of a five-year strategic plan." Technical Universities are meant to position Technical Vocational Education as a driver of economic prospects.